Don’t worry my friend, you are safe here. Run away and flee from the concerning internet chat rooms. Avoid the tyrannical 4chan, and Reddit sub blogs. There are no spoilers within my domain. Here you are safe… you can know the truth. The movie slams open where we left off in “Thor Ragnarok” introducing Thanos and the Black Order. A collection of his children/followers. 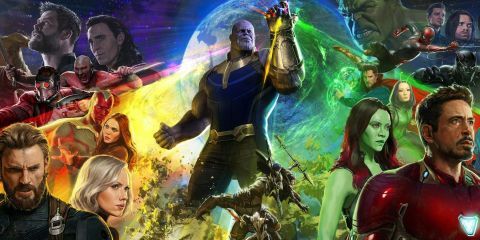 Where many Marvel movies begin to fall short in the aspect of their villain’s presence in the films, Infinity War smacks you in the face of exactly how much of a threat Thanos poses to this universe and how he can stand up to Earth’s mightiest heroes. This is very much Thanos’s movie in many respects, as we have spent 10+ years developing the Avengers, and Guardians of the Galaxy so they can finally take a back seat within the story. The movie treats Thanos with the respect of one of their main heroes. With the 10-year buildup, the audience only sees a glimpse of this tyrannical chair sitting Titan in brief cameo scenes. Many were scared the movie would treat Thanos as a generic big bad, but instead they deliver on his perspective and cause for trying to wipe out half of existence. Another fantastic element this movie delivers is when you see a certain character, or location on screen it feels like you jumped back into that specific movie. When we see the Guardians we are given a Guardians of the Galaxy movie vibe, when Black Panther is on the screen we are given the same famous music and color scheme of Wakanda. These different styles of movies brought to life by different directors feel remarkably captured under the Russo Brothers (“Infinity War” directors) vision, and always feel truthful to the characters Marvel has introduced to us over the years. Humor is always going to be an element in Marvel movies. Just accept it, please. However, it’s not always well done, and some of their jokes linger on for too long and can really be used to focus on other elements within the narrative of this movie. A big problem is how much of a comedic relief the character Drax has become in these movies. Sadly, the alien who would have the most emotional investment in this story outside Gamora is sidelined to just telling jokes and being the lovable oaf. Not knocking on the jokes, but they seriously undermined the potential within this character’s tragedy. My biggest gripe with this movie is that it is kind of a setup for the the next Avengers film. Don’t get me wrong, this setup does deliver extreme emotional moments, death and a true impact that this villain will bring to the world. It delivers on all the typical Marvel quips and fun character banter. However, this movie truly ends on a strong cliffhanger and the ultimate climax will most certainly not be reached until 2019. This may potentially be a spoiler, so if you are reading this paragraph go away and play on your Tamagotchi or whatever the kids do now. If you were hoping the Guardians of the Galaxy and the Avengers would finally all come together to defeat this mad titan, and be the team up punch fest of your dreams, this is not it…at least not yet, I hope. The movie splits up the characters based on who would have the best interactions, and it does a fantastic job at that! (Rocket and Thor buddy cop movie 2020, please.) However, we only get glimpses of these two teams interacting, and not all your superhero friends will meet the whole squad. Their stories can be very seperate, and the transitions between them can be clunky. Often times we are introduced to a specific scene that may not come back for what feels like 30 minutes. Regarding the ending, I will most certainly not spoil this for you, but this is the moment everyone on the internet is talking about. (No, Captain America and Iron Man don’t kiss. Get your hopes down.) Some call this a “cheap move” or an “F-you to fans.” Others don’t see the point within this decision because we know what’s going to happen anyways. I disagree with these points, as it shows the stakes and power the villain poses. This moment feels real to our characters, and will push their emotions in the next movie. Infinity War is a fantastic and emotional movie. It is filled with many sequences worth cheering for, and certain ones that don’t quite live up to the rest of the movie. Is this the 10-year pay off Marvel was hoping for…kind of. I feel like this was a good start but the real finale is going to take place in the untitled Avengers 4 movie in 2019. “Avengers Infinity War” is easily 9/10 prerecorded Stan Lee cameos. Catch it before it’s spoiled for you!